While there has been much debate about the wars in Iraq, the Balkans and Afghanistan, the most important aspect of those conflicts – the clearly racist, religiously-motivated decision by the American and UK armed forces to use depleted and non-depleted uranium munitions with enough inhalable radioactive material to kill millions of people – is rarely mentioned in the major media, which ought to regard the nuclear wars that the American and UK armed forces have fought over the last 19 years as the biggest scandal of modern times. There is concrete scientific proof that those wars could kill more civilians than the Holocaust, as I will now explain. A second scientist who works for the UK Government says, “the Americans and the MoD” are both aware that just one particle of DU dust can devastate the immune system, and thus leave people unprotected against life threatening illnesses: “… Roger Coghill, an experimental biologist who [sits on a Department of Health committee, which examines the risks from mobile ‘phone radiation, who runs a research centre in Wales, accused the Americans and the MoD of brushing the “biological truth” under the carpet. “One single particle of DU lodged in the lymph node can devastate the entire immune system””, to cite “Radiation tests for peacekeepers in Balkans exposed to depleted uranium”, in the “Daily Telegraph,” December 31, 2000. “…The report says that the types of cancer are “similar to that in the Hiroshima survivors who were exposed to ionising radiation from the bomb and uranium in the fallout.’ Researchers found a 38-fold increase in leukaemia, a ten-fold increase in female breast cancer and significant increases in lymphoma and brain tumours in adults. 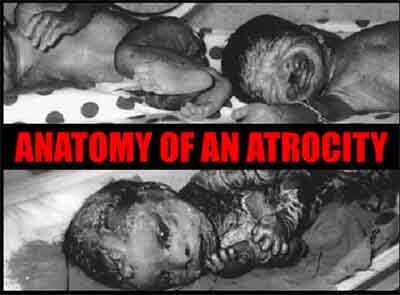 At Hiroshima survivors showed a 17-fold increase in leukaemia, but in Fallujah, Dr. [Chris] Busby [currently on the MoD’s Oversight Committee on Depleted Uranium] says what is striking is not only the greater prevalence of cancer but the speed with which it was affecting people.” – “Toxic legacy of US assault on Fallujah ‘worse than Hiroshima'”, “The Independent,” July 24, 2010. It is not just Fallujah where Iraqi civilians have had to put up with massively increased cancer, leukaemia and birth defect rates. If 40 tons of DU could kill over 500,000 people, and if 315 tons of could kill several million people, could “up to 2,000 tonnes of DU” kill tens of millions of people in just “the Gulf”? The July 24, 2010 “Independent” article also explained that people in Fallujah now have to put up with large numbers of babies being born with birth defects: “Iraqi doctors in Fallujah have complained since 2005 of being overwhelmed by the number of babies with serious birth defects, ranging from a girl born with two heads to paralysis of the lower limbs. If you have a strong stomach, and want to see photographs of the birth defects which the nuclear wars of the last 19 years have created, put the words “depleted uranium babies” into Google Images, and then wonder even more why the major media are not paying more attention to the biggest scandal of modern times, which will not just affect Iraq, the Balkans, and Afghanistan, as radioactive uranium dust can of course blow across national borders. “”I [Ray Bristow, British medical theatre technician during the 1991 Gulf War] remained in Saudi Arabia throughout the war. I never once went into Iraq or Kuwait, where these munitions were used. The fact that non-depleted uranium, which is 40% more radioactive than DU, has been used in Afghanistan, makes it even more likely that people who inhale uranium dust wherever it blows from that country, will be killed or made ill by it. “A small sample of Afghan civilians have shown ‘astonishing’ levels of uranium in their urine, an independent scientist [Professor Asaf Durakovic, who used to work as a US Army adviser] says. “… he found no trace of the depleted uranium (DU) some scientists believe is implicated in Gulf War Syndrome [as “”astonishing” levels of uranium” did not get into Afghan civilians’ blood by complete chance, it is thus obvious that NDU munitions have been used in Afghanistan]. “…Without exception, every person donating urine specimens [in Afghanistan] tested positive for uranium internal contamination. “The results were astounding: the donors presented concentrations of toxic and radioactive uranium isotopes between 100 and 400 times greater than in the Gulf veterans tested in 1999. This US Department of Defense denial that NDU munitions have been used in Afghanistan is not credible, because the Pentagon has lied again and again about DU. “Nato said last week that American aircraft fired 10,800 depleted uranium shells in Bosnia in 1994-95. Those aircraft had in fact contaminated 112 areas of Kosovo with DU, according to a March 14, 2001 article in “The Independent”, “Water in Kosovo could be poisoned with depleted uranium, says UN”. The dust produced when DU munitions impact and explode, can of course blow on to water. “Infantry were identified as potentially receiving the highest exposures, and the expected health outcomes included cancers and kidney problems. The above article includes a world map with most of the places where DU had been used up to 2002. I said “most”, because it does not include the Ministry of Defence Dundrennan firing range at Kirkcudbright in Scotland, and does not include the Pentagon’s test firing of DU munitions in Australia, for example, at Rockhampton in Queensland. A July 3, 2001 BBC News article, “Uranium shell tests halted”, discussed the MoD’s testing of DU munitions in Kirkcudbright, which has polluted the Solway Firth, as shells have been fired into it. The Australian documentary film “Blowin’ in the Wind” (short clip on YouTube and Google Video) is about the Pentagon’s testing of DU munitions in Australia. Two BBC News articles have also proved that the Pentagon lies about the dangers of DU. So the US Army knew 6 months before the 1991 Gulf War, that soldiers and civilians could inhale lethally large amounts of DU dust, but in the just cited November 2002 “Seattle Post-Intelligencer” article, the Pentagon was playing down the effects of DU on human health. So again, we see that the Pentagon lies about the medical consequences of inhaling DU dust. “The Guardian” reported on April 17, 2003: “Scientists urge shell clean-up to protect civilians.” Even the Royal Society, the UK’s leading science organisation, has accused the Pentagon of lying after the Pentagon claimed that the Royal Society backed its claims that DU is not dangerous. Anyone who wonders how the Pentagon could be run by people who are inhuman enough to kill possibly tens of millions of people with DU should be aware that a number of American Cold War generals were in favour of using nuclear weapons that could kill possibly tens of millions of people. Not only the Pentagon, but the George W. Bush Administration has been exposed for lying about the Iraq War, so no one should be surprised by the Pentagon’s serial lying over the DU issue. So the Bush Administration lied about the invasion of Iraq. Of course, telling American service personnel that they had to risk their lives to enrich the wealthy people who run the Bush election campaign like Exxon-Mobil, would not have sounded so appealing, so various lies were told to convince them to fight, and to convince the US public to support the invasion. In his 1935 book, “War Is a Racket” (Roundtable Press, New York), Major General Smedley Butler, the former head of the US Marine Corps, and the most decorated soldier in US history, revealed that during his 33 year career in the Marines, he spent most of his time fighting wars to ensure that big business could make money as a result of them. The more than 500 above-ground nuclear bomb tests of 1945 to 1980, the 1945 Hiroshima and Nagasaki bombs, the Chernobyl disaster, and other nuclear power plant and nuclear weapon accidents, have created radioactive dust, still lethal today (former US Army Major Doug Rokke, interviewed by “Yes” magazine for a March 31, 2003 article entitled “The War Against Ourselves”, pointed out that the consequences “last for eternity. The half life of uranium 238 is 4.5 billion years [which means of course, that in 4.5 billion years, the uranium which the US and UK armed forces have left in Iraq, will only be half as radioactive as it is now]. And we left 320 tons all over the place in Iraq.”). However, the amount of radioactive dust which has been created by those sources, may have been dwarfed by the amount which the nuclear wars of the last 19 years have created.